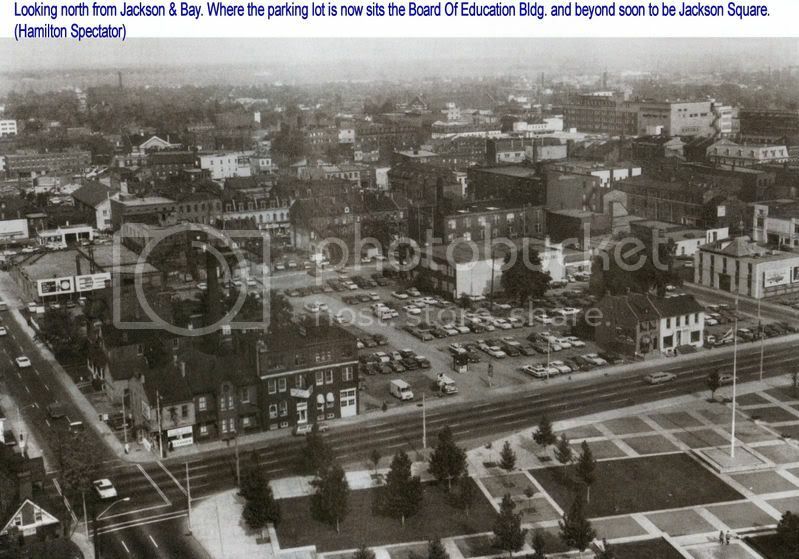 Nearly 50 years ago, the Hamilton board of education decided it needed to build a headquarters. It planned to do that on land it owned in the Westdale area. Hamilton city council believed it was important to have the board downtown. The board disagreed. So council got creative and looked for a suitable site in the core. It expropriated land on the east side of Bay Street between Main and King and turned it over to the board at a deep discount. The rest is history. We can learn from history. I wrote often about Hamilton's history in my StreetBeat column in The Spectator. When I left the paper in January after 30 years, I joined the city's Heritage committee. One topic up for discussion was the board of education building. I hate to see that distinctive structure go, but it looks as though that battle is lost. And it is wonderful that McMaster will finally have a significant presence downtown. But I don't understand why the city seems content to now lose those several hundred good board of education jobs in the core. Yes, we'll be replacing those lost jobs with the McMaster development. But downtown is still a fragile place. Our core needs every body it can get. It needs people in the stores and restaurants and it needs life on the streets. Downtown cannot afford to let those education jobs slip away. So I hope that council of today will now work as hard as that council of yesteryear to persuade the board of education to stay downtown. The core certainly has room for the board. The $31.6-million headquarters the board wants to build in the suburbs is to be 113,00,0 square feet. There is that much space and more on the nine empty floors at the top of Hamilton's tallest office complex, Stelco Tower. You have to believe the owners would be glad to change the name of that landmarlc for an important tenant. That's just one option. I'm sure council can come up with others. It's true that the board of ed answers to the province, not City Hall. So perhaps our new minority government at Queen's Park could be helpful. Andrea Horwath has been a strong advocate for the core. It is, after all, her turf. The province might want to know why the board plans to spend so much on a new headquarters when money is tight and when student enrolments are predicted to decline for many years to come. And after all, the local separate school board has operated successfully for decades from its downtown headquarters and has no plans to move. The public board surely wants to do right for Hamilton. It knows Hamilton must have a healthy heart to prosper and to be a city where graduates can live and work. It's now up to city council - maybe an assist from the province - to help the board of education find a way to do the right thing in downtown Hamilton. Jason, I beg to differ. It would appear that Hamilton is fast becoming the place to fight the wrong battles. Any one with some knowledge of architectural history would affirm that the Board of Ed building is at best a highly quirky example of a phase in Hamilton's history where very little of architectural substance was ever built. While this quirky building is being characterized as history and romanticized - the new medical use by McMaster is being lauded as bearing significant presence! Both these building the current Board of Ed structure and the proposed glass clad medical facility share one common theme - 'lifelessness'. One only has to walk around the Board of Ed building at any time of the day or night to experience its deadening impact. Just as one has to walk around Hamilton's many medical buildings to realize that these life-giving buildings don't necessarily spawn life around them. Besides, true architectural value springs from an implicit sense of connectedness to the present and to history - which needs few words to substantiate it. Both of the above buildings and their uses requires way too many words to establish their rationale. The Board of Ed has decided to move from the core. Let them go where they want to be. It is no longer a living institution, it has become a dead weight of bureaucracy and intrigue. It needs its privacy on the mountain, it is old and tired and simply not capable of bringing any kind of vibrancy to itself, let alone to the core. Just let it go where at least it will be happy. But if you must fight, then fight to bring the School of Liberal Arts out from the suburban campus before it gets built there, into the heart of the city - and make it stand proudly on the same square as the art gallery, the theater and convention centre. In doing this you may finally see the youthful vibrancy you crave so much in the core. About older buildings built in Canada over the last four to five decades, it is important to realize that most were not built well. The coming shock of renovating these modern, stylistic white elephants that constitute our education complex should not be a surprise for they were all built not to last. They were after all in keeping with the times which abhorred history. There are similar reports for scores of school boards across the country. So while we fight to save the Board of Ed building which is in poor shape already, we overlook the immense potential being lost by faulty planning which puts wrong uses in right places; or simply stand by and watch real architectural heritage that is worth saving being ravaged by wrong use at Mohawk College's old campus on Wentworth Street North - a fine green building designed and built to outlast the even greener new buildings yet to be built on the campuses of our education complex. What does a capital cost report on Ontario colleges have to do with whether we should demolish the Board of Ed building? 'Quirky' or not I don't need an architect degree to see the Board of Ed is a beautiful building and well made. All the stuff you say about it, people said the same stuff about the other beautiful buildings in Hamilton, some of them saved but way too many lost to short sighted thinkers. If we let it get torn down, one day people will look at old pictures of it and wonder what the frig was wrong with us. Sure Board is clueless but they've always been clueless, they wanted to move to the suburbs 50 years ago. It's the job of council to be less clueless about urban renewal than school board trustees. If we let it get torn down, one day people will look at old pictures of it and wonder what the frig was wrong with us. Yes, exactly. The Board of Ed building is currently in the Trough of Public Appreciation, but if we can resist the urge to put it out of our misery, it may well emerge as a charming (and rare) example of modernist, mid-20th century public sector administration. easily dismissed, but with a longer look its beauty starts to creep in I think. It combines the spareness and stark lines of brutalism with a certain grace in a way that most buildings of the era - think of Robarts and many other university buildings of the 70s - did not. But more importantly, this isn't even a debate we need to be having. Mahesh you always end up making things into a polarity, one side against the other. It's like LRT v GO. Why do we need to have either the BoE or the downtown campus? The only reason this whole issue has come up is because Mac wants to get a free site to build on, plus with no servicing costs because it's downtown. Meanwhile the BoE gets a mountain site and won't pay any fees to the city for its new build. It's a crazy game of internal rivalry within the public service, classic silo-ism, one upping another public entity without any regard for the fact that these are public buildings and concerns. Methinks we need a regional planning authority. The "wrong battle" is the perennial debate over which old building is more 'deserving' of survival. Every structurally sound building already standing is a gift from the past that we should cherish and put to good use. We would already be doing this without prodding, if only we could bring ourselves to fix our broken system of incentives for developers. It's a false economy for the Board to want to build a two-storey box on the south mountain - a false economy propped up by a whole package of subsidies, incentives and regulatory momentum. The "wrong battle" is the perennial debate over which old building is more 'deserving' of survival. The 'wrong battle' is actually a perennial situation where, in crisis and desperation, we cling to those things we cling to, and a good deal of this clinging is simply a reflexive reaction...and because not much good gets done decision making-wise in a state of desperation, it makes for pretty sad viewing. We would already be doing this without prodding, if only we could bring ourselves to fix our broken system of incentives for developers. Once again, you're looking at a quantifiable process, because that's where your wiring leads you. I look at something more connected to how engaged people are with the city in which they live...and the fact that there's this systemic disconnect on 'the average person's part'. So for me, while it's fine and dandy to look at flawed processes...and I'm not arguing against your point, that our rules and regulations re: development are suspect at best...the more basic truth isn't about 'Them'...it's about 'Us'. don't get me started on Sanford Ave, Mohawk etc.... that whole area could have been amazing, but as per usual, let's just plop more social services down. Watch for more school demolitions further east once the Ticats get their hands on one or more buildings they 'need' for parking lots. I'm all for putting the Board of Education into the Stelco tower, but my question would be, isn't the Stelco toward owned by Yale properties? If so, is the cost of rent really worth the cost of building? I also have to agree with Mr. Butani on this one, although mainly because I'm of the opinion that there are many better battles to fight for historic architecture then the BoE building. Reading Paul's letter it's clear that he isn't fighting for the BoE building. He's fighting for the jobs to stay downtown, regardless of where they end up. He event mentions that he's pleased (as am I) to see McMaster coming downtown. The BoE is as good as gone. He's right though - it's a public organization and we should keep it downtown as council did 50 years ago when the Board wanted to move to Westdale. Surely they could make a bunch of money selling their Mountain property for townhomes. I recall an investigation and picture video of BoE by Graham Crawford that opened my eyes to the beauty if it. I think Mr.Butani with all due respect does not have the architectural vision Mr.Crawford does. Mahesh, do you have more info/links you can provide for the School of Liberal Arts? I did a quick search around and I am not sure what institution you are referring to? It does sound like something that would breath more life into downtown than a school board that doesn't want to be there. Following Twitter, I find that although it's not all the younger generation, but a large number of our youth are promoting the heck out of Hamilton and how much they love it here. Many more are moving here from Toronto way and encouraging their friends to come here too - especially the Arts community. We should be encouraging people who we know want to be in a downtown and who would help us transform it into the place many already feel it is. I believe a Royal Connaught reno will go a long way. It should have never been allowed to sit boarded up this long. The overhangs are falling apart and who knows what is leaking out of them. The painted particle board over the windows has this awefull stench to it. Why HSR put a bus stop where the old Last Minute Larry's used to be during John construction is beyond me. It stinks to high heaven and there is very little foot traffic. That building brings down our core so substantially. We should be keeping a closer eye on buildings and being very forceful towards not letting them degrade the way some downtown buildings have been allowed to do. At some point it should either be fix it up or we are taking it over. With the Connaught, all those windows should have been left open and lighted this entire time, with art displays in them so downtown didn't look so dark and abandoned at night. Boarded up buildings in general should not exist except for maybe a brief three month construction period although I even question that. The King Entrance next to the Honest Lawyer into Jackson Square looks terrible. There must be an alternative to boarding up? Even a mural on the board or something? Art is always a good way to dress up anything that looks bad. Downtown can't wait for people to get their stuff together anymore, and something has to be done in the meantime to clean it up. The new "Liberal Arts for the 21st Century" building will provide much needed new space for current and new undergraduate, graduate and research programs in social sciences, humanities and health sciences. The Liberal Arts building will include inspiring, state-of-the-art lecture, meeting and study space equipped with the most advanced technology. It will be home to collaborative programs, centres and institutes. And here is the BOE building site in the core. "they haven't maintained the building at all, since they have always planned to move. From what an employee has told me, they haven't so much as painted a wall in that old building. I would say shame on the board..."
Bingo. Shouldn't buildings require inspection to ensure they aren't being allowed to rot because of intention to eventually move. How many are being neglected on purpose because there is a devloper that wants the property and once it get's to a certain point of decay, the its falling apart card can be used? How long has the City/Mac been eyeing this chunk of downtown land? The Mac continuing Ed site is a nice example of re-use (not that I know what it was before). I too love the facade of the Board-Ed building. I bus by it twice a day. Obviously how it ads to downtown isn't based on tenancy who has long since been looking for a way out of the core. It seems a big concern with Mac moving in from previous conversations with Mahesh, is that they will likely build their own cafeteria and the added 50 people who will be working downtown, may not even be supporting all the amazing local small business eateries that surround it. Institutions like Liberal Arts would likely enjoy the growing night life and trendy new(er) joints that are popping up. The MacMaster Continuing education building was the old CourtHouse that moved and expanded the old post office. Honestly if Mac wanted to move downtown how about expropriating and adaptive reusing the Connaught for it. WIth all the ballrooms it would be great for lectures. Honestly, if the BofE decides to build a building from scratch, the City should put their foot down on one issue: it should be a general-purpose bland office tower. No architectural hints that it's the BofE. Then when they decide for whatever fickle political reason to relocate, it can be resold as office space instead of being yet another albatross like the current BofE building. Maybe they don't want to move into Stelco Tower because they are asking $40 /square foot in a severely out-dated office building? The Board has used the Maple Lane School as a venue for offices and professional learning for several years and used the Seneca building (now torn down, site sold to a developer) for the same purpose before that. When I learned that they were planning to move to Crestmount I assumed (naively) that they would retrofit the existing building as they have done elsewhere. It never occurred to me that they were planning to spend 10s of millions of education (i.e. taxpayer) dollars on demolition and the cost of a new office building 100 m from Limeridge Mall. It would be interesting to see a cost analysis of financing and constructing a new building on the Mountain vs. renting existing office space in the core. The Right House will be empty soon, why couldn't the BoE locate there? And that's just surface parking. It doesn't include indoor parking for the AGH, Jackson Square and City Centre. No parking? Downtown is one enormous parking lot. I came across a wonderful documentary on Beauty, called: Why Beauty Matters ( 1, 2, 3, 4, 5, 6 ) by Roger Scruton - which is worth a leisurely watch! Scruton reminds us that "...our lives are full of leftovers, we battle through ...distractions, and nothing resolves. The right response ...is not to endorse this alienation, it is to look for the path back from the desert..."
Every age has grappled with the idea of beauty. Some ages even threw up canonical beliefs about beauty, which lingers through our age in fragments sowing confusion about beauty in our times. For over two decades the Vitruvius of our age, Nikos Salingaros, Christopher Alexander and other, have being attempting to tell us about a new path back from the desert to reclaim beauty in our age. But not many among us are listening. The coalescing of arts, sciences and philosophy via the field of Biomimicry and the emerging field of Biourbanism could lead us to an age where 'beauty' is no longer a debatable virtue, but a societal value that binds us all in a shared understanding of beauty. Note -- "Architects still believe that they are eligible to use the act of building for personal exploration and expression. They are creating architecture that makes little reference to anything, only their innate gifts." Thank you for linking to the article which makes it clear that this quote is referring to the 'starchitect' phenomenon. I certainly hope you are not trying to tar Joseph Singer with that brush. Thank you highwater! I don't know Joseph Singer at all. If anything, my attempt has been to remove the tar from our preconceived notions of beauty. And possibly supplant it with ideas which leads us towards a shared understanding of beauty. While Joseph Singer's work is indeed being canonized by many in our city - and which is perfectly fair, I just hope that Mr. Singer also agrees that it is only fair for some among us to offer a critique of his works which may help evolve the definition of beauty. Critiquing it is fair. Suggesting it's acceptable to demolish it because it doesn't fit your particular notion of beauty, is not. Personally I don't care for Victorian architecture, but I wouldn't dream of suggesting that buildings from that period are expendable. You and I both know what happened to this city when a group of people decided their personal dislike of Victorian architecture entitled them to do away with it. It just so happens that I have considerable knowledge of architectural history, and I think the BoE is a beautiful building, so I'm not sure what makes you suppose that all knowledgeable people share your dismissive attitude. I would never be presumptuous enough to suppose that my opinion, informed though it might be, entitled me to act as judge and executioner over our shared built heritage. The loss of this handsome, well-built, perfectly sound building likely won't be fully appreciated until we get a load of the off-the-shelf, suburban business park glass box that it will be replaced it with. It is a tragic waste of human, economic, and material resources to chuck it into a landfill. These are the primary reasons that many people oppose its demolition. It is patronizing of you to refer to this perfectly sensible desire to use our built resources wisely, as some kind of fanboy 'canonization' of Singer's building. The loss of this handsome, well-built, perfectly sound building likely won't be fully appreciated until we get a load of the off-the-shelf, suburban business park glass box that it will be replaced it with. I'm sorry, but I don't see this as The Great Lesson to Be Learned. And I am once again concerned about conflation; is this all about a) the loss of a (subjectively appraised) downtown landmark, b) the self-serving interests of players, c) a lack of vision about not only what our downtown could be, but what it will be with a medical facility playing the part of anchor, or d) railing against change? It is a tragic waste of human, economic, and material resources to chuck it into a landfill. I'd much prefer we not combine the issues without being honest about addressing all of them singularly, first. And I'm not convinced that most of the 'discussion' facilitates this. These are the primary reasons that many people oppose its demolition. I don't agree. And if they are, then from my perspective, that's a little myopic. Surely this discussion can be more evolved than that, can't it? It is patronizing of you to refer to this perfectly sensible desire to use our built resources wisely, as some kind of fanboy 'canonization' of Singer's building. I don't find it patronizing in the least. And I'm still scratching my head at the umbrage you (and others) have taken at Mahesh's comments. Following on this, the accusations of condescension, etc. I've seen nothing in his remarks that strikes me this way. He acknowledges that the aesthetic merits of the BOE building are subjective. He puts forth his qualified opinion, he doesn't lord it over anyone...however, I think it's reasonable to at least acknowledge his background and credentials. Otherwise, we begin to wander down that nasty road that many in the US are prone to want to: that of accusations towards the 'intellectual elite'. Again; surely we're better than that. In an unrelated discussion this week I was asked "Why do conversations in Hamilton always hit a wall?" My answer was basically that there's too much frustration, that often those involved are weary, therefore additionally prickly...and that in the end, graciousness is mostly absent from the city's discourse. You and I both know that we have no control on what will get destroyed or what will get built in this city -- yet we do choose to remain engaged! I have never suggested that we demolish the BOE / Singer building - in spite of my personally not considering it to be architecturally significant in style or plan. In fact it is to the contrary that I have always spoken of on such matters here, ever since our very kind baba ghanoush guarding editor first published my thoughts. Why no one wants to wage a battle to bring the School of Liberal Arts into its most logical location in our city core is puzzling to say the least. Could it be that we the battle-weary guards have finally succumbed to the idea that anything is good enough for us? Or do we genuinely believe that a promise of 400 doctors next to the art gallery is what this city needs to rejuvenate its spirit? Once again, the AGO-OCAD-Grange Park co-location serves us as a reminder of the magic that can happen if the right mix is planned in urban environments. I truly am sorry for my views Mr. Singer... I hope you appreciate my dilemma. I am not 'upset' with your 'opinion'. I am turned off by your condescension and belittling of those you disagree with, and have grown tired of knocking myself out winnowing the scant grains of wisdom from the chaff of your arrogance. This cowgirl is done. "...have grown tired of knocking myself out winnowing the scant grains of wisdom from the chaff of your arrogance." ---- is sheer poetry...and by far the best outpouring that has come out of all this!! Proselytizing on blogs to a core of mirror-mouthed faithful and the occasional frustrated troll is not the most elegant solution to a bricks-and-mortar challenge. What we need are private developers or well-heeled citizens who are able to see the value in saving these buildings. Shame that almost all of those we have tend to gravitate to the leafy suburbs around the core. As Wilson says, "Our core needs every body it can get." If you're working downtown and living elsewhere, even 10 minutes away, you're not doing all you could. I'm pasting in some information about the New Formalism style of architecture, of which the BOE building is an example. In my opinion, a good example. The text appeared as part of the exhibition I did on the Board of Education building at HIStory + HERitage a few months ago. Thought it might help put the BOE building in a broader context. The New Formalism is a style of architecture developed in the mid-1950s as practitioners of modernism sought new modes of expression not so tightly bound by the rigid formulae of the American version of the International Style.Also known as Neo-Formalism, or just Formalism. A maturing modernism grasped the many commonalities with classicism, such as emphases on structure and a uniform construction grid, a carefully organized hierarchy, and clarity of geometric form. Searching for symbolic meaning, modernist architects of the mid-1950s through the early 1970s embraced Classical precedents in establishing building proportions, in the use of the arch, stylized classical columns and entablatures, and in use of the colonnade as a compositional device, as well as the elevated podium. Characteristics drawing on classicism include rigid symmetry, use of columns and colonnades or arcades, and use of high- end materials (such as marble or granite), yet works in this vein also characteristically use the flat roofs common with the International Style. Traditional rich materials such as travertine, marble, or granite were used, as were manmade materials that mimicked their luxurious qualities. On a larger urban design scale, grand axes and symmetry were used to achieve a modern monumentality. Primary in developing the New Formalism were three architects: Edward Durrell Stone, Philip Johnson and Minoru Yamasaki, all of whom had earlier achieved prominence working within the International Style and other modernist idioms. Stone's well published American Embassy in New Delhi (1954) is considered by many to mark the origin of the movement. Edward Stone produced his first southern California design in the mode of New Formalism in 1958. His local masterpiece, the Stuart Pharmaceutical Company Plant and Office Building on East Foothill Boulevard in Pasadena was recently placed on the National Register of Historic Places (NRHP). The complex includes landscaping by eminent landscape architect Thomas Church. Stone was responsible for some of the best examples of the style locally, others of which are all single, freestanding buildings. The cultural and performing arts centers, and other civic construction that became so significant a part of the American public landscape in the postwar era, encouraged by a wealth of government incentives, were often the product of the New Formalism's union of Classicism and Modernism. The Lincoln Center for the Performing Arts in NewYork was at the forefront of this development. Planning for the Lincoln Center commenced in 1955 and its first element was completed in 1962.The Center is organized around a public square of ceremonial proportions, framed by colonnades and an arcade on three sides, opening to the city on the fourth. The three travertine sheathed performance halls, Philip Johnson's New York State Theatre, the Metropolitan Opera House by Wallace K. Harris, and Avery Fisher Hall by Max Abamowitz, form a unified enclosure for the highly formal plaza designed by Phillip Johnson.The complex explicitly recalls the formal order of Michelangelo's Piazza del Campodoglio in Rome.The complex also includes the Vivian Beaumont Theatre by Eero Saarinen, and Pietro Belluschi's Julliard School of Music.The body of scholarly study of the Center has been steadily expanding and the complex was recently determined eligible for inclusion in the NRHP. "The success of the New Formalism in the America of the 1960s is not hard to account for ; in an affluent society it lends itself to the use of expensive materials (as well as materials that only look expensive); in a society that aspires to culture it flatters the spectator with its references to the past; in a conservative society it suggests that the old forms need only to be restyled to fit them for new needs" (Whiffen p. 260). The style was embraced by the local arbiters of establishment taste. For each of the three major arts complexes completed in the United States during the 1960s, the Los Angeles Music Center, Lincoln Center for the Performing Arts in NewYork, and Edward Stone's Kennedy Center for the Performing Arts in Washington, D.C., the New Formalism was employed as an appropriate synthesis of civic authority and Classical monumentality. In southern California the style was applied mainly to auditoriums, museums, and college campuses. Completed in 1964, the Los Angeles County Museum of Art (LACMA) was designed by William Pereira and Associates.The LACMA complex was originally comprised of two large galleries and an administrative/auditorium building placed upon an elevated podium and arranged around a formal central plaza that opened to Wilshire Boulevard. The University of Southern California (USC) in Los Angeles, California Institute of Technology and Ambassador College in Pasadena, and Harvey Mudd College in Claremont all possess significant works of New Formalism by major architecture firms. Other significant examples of New Formalism in Los Angeles include the Ahmanson Center Building on Wilshire Boulevard, Beckman Auditorium at Caltech, and Ambassador Auditorium in Pasadena. Excerpted from Historic American Building Survey prepared by Teresa Grimes. Graham, Thank you for your post titled: "Understanding the New Formalism Style". While we may differ on our read of architectural history on account of our backgrounds, as stated earlier I do admire your passion for documenting and promoting local architecture. While I recognize that Edward Durell Stone among a few others you mention have produced good examples of New Formalism, however --in my personal opinion-- which has evolved over 35 years of professional interest in architecture & urban design, Joseph Singer's BOE building is not a great example of this short lived style. It does not imply that I am suggesting its destruction. The BOE, McMaster and the City are the ones on an irreversible path, while I am merely suggesting that we come to terms with it and focus our energies on the proposed use, and worry about its built-form later... in that order. I will expand on why I feel this way about the BOE building, and you are free to disagree, but do recognize that comments such as the one below destroy conversations. Most architectural styles in Canada imported from US or Europe were prone to dilution of the original intent and turned into a pale and often limp version of the original style. This was the context in which most architectural styles evolved in Canada: "Architecture in transition - from art to practice, 1885-1906, by Kelly Crossman". It is important to compare this with the context in which styles originated in other countries in order to allow a clearer understanding of local architectural practices and their responses to styles. The dilemma of Canadian architecture in my view is that even after a hundred years, it is still in search of its cultural identity and continues to remain enslaved to popular styles from abroad while remaining in denial of its enslavement. A condition entirely self-inflicted by the local architectural profession from its choice to remain culturally self-centered and obsessively insular for over a century. So what you see as architectural styles here, is in my opinion only poorly rendered formalistic gestures devoid of cross-cultural influences - Gestures which are primarily based on a slavish imitation of form and resulting in its lack of substance - much similar to the beautifully framed generic art prints available at annual art expos, which many people love, and buy, but someone with your or Highwater's appreciation of art and architecture may cringe to place on your mantelpiece. "Modernism was a revolt against the conservative values of realism" ...The poet Ezra Pound's 1934 injunction to - Make it new! was paradigmatic of the movement's approach towards the obsolete." To truly appreciate New Formalism in architecture, one needs to dig into its namesake period in poetry over a different time-line. "Formalism arguably began much earlier, with Richard Wilbur, whose first collection, 'The Beautiful Changes', was published in 1947. And formalism in one sense had never been dead. But the New Formalism was rather different, notably in its proselytizing role, its marked antagonism to free verse, and its stress on metrical correctness." New Formalism in architecture was born as a formalistic escape from the trappings of the aesthetic starkness and material austerity of the late modern/international style -- essentially a response to the then wounded Modernist philosophy which had generated much cultural and social alienation in the post-war era. New Formalism in my view had a close parallel in its approach to generating form with the short lived transitional style of the mid '30's called Postconstructivism - which "converged from opposite directions - neoclassicism and constructivism" and also defined as "neoclassical shapes without neoclassical detailing" -- "Postconstructivism benefited from a natural reaction against both the avantgarde and the eclectics of the past. It was perceived as new, and at the same time allowed grand buildings that were to the taste of provincial elite." However many adherents of New Formalism in my view cannibalized forms and motifs from earlier styles and applied it far more superficially to buildings. In doing so without rigor, its plans and more importantly its cultural and spatial connectedness to people failed miserably. A detailed study of many buildings of this era confirms that. This style was not born from an impulse to address the emerging social, human and environmental degradation in the mid 50's to late 60's. In fact the post-war ear was a confusing time in architecture, and there were many divergent paths taken by the leading architects back then. New Formalism was one such foray which made use of elements from formal classicism with modernist bombast. In doing so, the resulting ornamentation was an afterthought to the essence of form - an appliqué approach of sorts to architecture. Something which most styles such as Art Deco, Streamline Moderne, Art Moderne, the Googie style, or the Mid-Century Modern avoided by making all embellishments an integral element of its design instinct. Something which the garish Post-modern architectural style took to an extreme by turning the very form into an embellishment. Architects like Stone and Beckett were more successful than others in some of their works. But in the Canadian context - on account of the professions insularity, New Formalism, an already a tricky act, got diluted and a style that was essentially superficial in spirit, was rendered even more superficial with poor handling of proportions and materials and more importantly a total disregard for the spatial aspects of buildings. It is from this that I sense the total disconnectedness between the BOE building and its surrounds. In my view this building just sits there drawing attention to itself as a quirky bauble would from another era, oblivious of its lack of design rigor, or its lack of a spatial narrative - essential for life to thrive around it. One can only imagine what our world would be today had the architects of that period focused on more important matters facing civilization back then. One successful example of this period which in my opinion worked very well was the US Embassy in New Delhi by Edward Durell Stone. This rare success only came about on account of the manner in which it was constructed (see evaluation by docomomo). In earnestly adopting an arts & crafts movement approach in the construction of this building, the architect here managed to transcended the formalistic limitations of the style with a conscious attempt at cross-cultural pollination from which springs its timeless qualities. Buildings such as the BOE in my opinion fail to transcend its style and further appear dated on account of its mathematically odd proportions and massing, coupled with its awkwardly dense window pattern and weak arches dressed up by embellishments by way of art panels and the bronze frieze all affixed on the shell of an otherwise poorly planned building. Outside of the example in New Delhi, and to an extent in NYC,(1,2) Washington DC and LA, there are very few examples in my opinion - of the transcendence of form from this period. And it may well be the slavish false colonnades which were gratuitously slapped onto plain boxes that became this styles undoing. "The success of the New Formalism in the America of the 1960s is not hard to account for ; in an affluent society it lends itself to the use of expensive materials (as well as materials that only look expensive); in a society that aspires to culture it flatters the spectator with its references to the past; in a conservative society it suggests that the old forms need only to be restyled to fit them for new needs" (Whiffen p. 260). In trying to be everything to all, New Formalism in my opinion failed to become itself. Your profile of New Formalism is a reproduction in its entirety from the marketing blurb on the website of Beckett's Music Centre in LA - which is a reproduction of Teresa Grimes' take of this style. This to me may not be an ideal approach to un-layering the history of a local response to an imported architectural styles by an insular local profession that continues to mimic form rather than assimilate principles. Unlike the architecture of the 20's & 30's such as the Pigott building which was built on far deeper beliefs and a more rigorous understanding of form, materials and proportions, and from which it derived its aesthetic longevity, much of the New Formalist architecture, just like our stick-built suburban mac-mansions with their fake ill-proportioned arches, gratuitous keystones and foam colonnades may pose a serious challenge to even the most well-meaning 'troughs of public appreciation'. Slapping marble on poor form does not legitimize the form or the style it is attempting. In most large cities, much bad architecture co-mingles with ease among good architecture. I think it is the halo of the good architecture that manages to wash out the bad architecture around it with its light. In Hamilton where good architecture has been substantially decimated, its halo is weak or often non-existent. Many of us recognize this tragedy, and this drives our strong desire to save anything and everything that is left standing from another age. Hence often we are consumed by the wrong battles around styles and troughs of aging, while poor planning decisions continues to expand the raw texture of our city. "the granting of architectural commissions rarely involved an actual competition where the ability of the architect or the quality of the design might be decisive factors. Rather, the key variables in any particular decision usually were family and personal connections, church and club affiliation, and political party membership." ~ The Architect and the Community. If people like you, Highwater, Paul Wilson or Terry Cooke who have traction with architectural thinking in this city don't lift the public conversation on architecture here, who will? Burying inconvenient conversations as fast as they begin may no longer be an option if you want Hamilton to grow into a big league city. Leading such conversations from here on is your call. Failing which the absurdity of aesthetic, social and spatial disconnects will continue to thrive in our city. Our new farmers market may not be the first or the last of such recent social & spatial disconnects (a,b). What is happening to Ward 3 presently would shame all such disconnects. Stop being so hysterical, Graham. The BoE is just a quirky building in a city with no architecture of substance. If you had any knowledge of architectural history you would know this. I don't know if there's a very cunning strategy at play here, but this story is really becoming an outrage for me. Useful, reusable building downtown being destroyed, new building being put up subsidized by the city for any servicing costs, with rent paid by the city above market rate for public health to go there, with consequential loss of plans in place to develop downtown space public health was already looking at on King st. Plus BoE gets building on the mountain, paid for out of property taxes plus development charges, on which they pay no tax. And meanwhile the discussion many are having is over aesthetics, as though that had anything to do with it. The result of this will be that Mac and the BoE get sweetheart deals, the mayor and council get a PR coup, and the city and our already dire financial situation gets further decimated. It makes me think that Bob Young was pretty much following this exact same script last year, but for whatever miraculous reason we saw through it. Maybe the aesthetic value of Ivor Wynne was not enough to provoke the same sorry sideshow that has taken place here. Maybe the renderings of the new campus were just too seductive. Maybe the school board and university are just too unaccountable and distant for anyone to think they have a chance to influence their decision-making. But in any case, this win-win-win for public institutions and personalities is a big lose for people who pay the taxes and use the services.